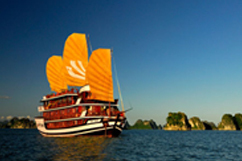 Built in oriental style with contemporary luxury, Bhaya Cruises established new standards of luxury cruising in Vietnam. 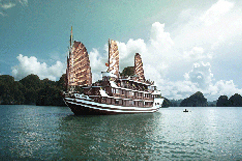 Bhaya fleet now consists of 03 Classic vessels, each offers 20 luxury cabins and suites accommodating a maximum 40 passengers for Ha Long Bay cruises. 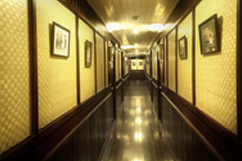 Cabins: All Deluxe cabins and Royal Suites are well appointed, with traditional Vietnamese hardwood creating luxuriant warmth. Light materials and large windows ensure that each cabin is bright and airy. Hand-crafted hardwood furniture, gold and white fittings, and delicate upholstery further enhance the warmth and light in each cabin. Deluxe cabin (12.5m2) offers all the amenities necessary for you to feel comfortable: twin beds or a queen-size bed, air-conditioner, wall fan, refrigerator, en-suite bathroom with shower. Each features a picture window, providing added light and memorable views. The two sumptuous Royal Suites (16.5m2) are located in the forward section of the upper deck, offering panoramic 180° ocean views. Each Royal Suite offers all the standard amenities of a Bhaya Suite, plus a larger en-suite bathroom with bath-tub, a plush sofa and exclusive access to a private viewing area on the upper deck. 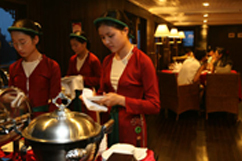 All onboard meals are prepared by qualified local Vietnamese chefs under the guidance of European management team. Meals are timed to take into account each day’s programs and activities. There is an early riser’s breakfast available from 7 am. The full breakfast buffet is ready from 9:30 a.m. until check-out. Lunch is served between 1:00 and 2:00 p.m. Dinner is served between 7:00 and 9:00 p.m. All meals are single seating with an open-seating format. _Beauty Spa and Massage: The Beauty Spa and Massage area sets new standards in onboard spa design. 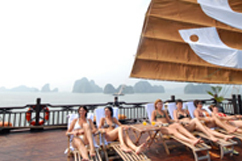 The combination of the vessel’s natural tones, water elements and traditional Vietnamese-style massage and spa services offer a uniquely revitalizing and invigorating experience. 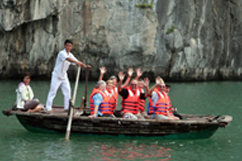 _Onboard Activities: Swimming, snorkelling and kayaking in the crystal waters of Ha Long Bay are favoured activities for the energetic, while morning Tai Chi on the Sundeck offers a meditative and uplifting start for the more contemplative. 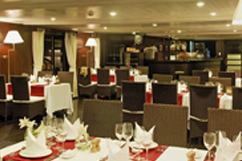 Outings and tour excursions to islands, caves or villages in the Bay and cooking classes are just a sample of activities onboard a Bhaya Cruise.